Spring is in the air, and, in some places, it still feels a bit like winter. But never fear! A new Starbucks Happy Hour is en route to accentuate whatever you're feeling about the change of seasons. Hot drinks for anywhere it's still unreasonably cold and iced drinks for everyone who is ready to transition their caffeine to a summer favorite. On Thursday, March 21, Starbucks is offering 50% off espresso drinks size grande or larger. The deal is good from 3pm to close at most locations across the United States (maybe double-check with your local store to make sure). Starbucks' brand-new Cloud Macchiato drinks are on the espresso beverage menu, so this may be a good time to give one a try. However, the discount excludes hot and cold brewed coffee, Frappuccinos, Starbucks Reserve drinks, and any ready-to-drink beverages. Cloud Macchiatos are Starbucks' latest -- and perhaps weirdest -- drinks. Basically, they're a twist on the cloud-less original, and they're made with espresso and super fluffy whipped cold foam rather than espresso and regular liquid milk. The drink comes in two flavors, Caramel, which tastes almost exactly like a regular Caramel Macchiato, and Cinnamon, which sports cinnamon flavors and some nice hints of lemon. Both versions come "marked" with Starbucks’ signature caramel sauce crosshatch on top, and both are surprisingly thick and decadent, thanks to the thick, meringue-like foam that makes up roughly half of the beverage. 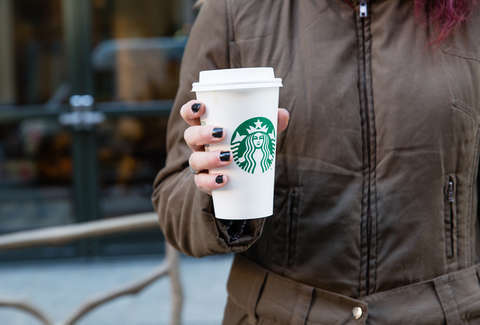 Here's how to get the deal: Download the Starbucks mobile app and sign up for the rewards program if you haven't already. You used to be able to sign up for an email to get the discount without the app, but that changed in February. The Happy Hour deals are now exclusively available through the app (it's free to sign up for the rewards program, less the data that companies get when you use their apps). Once you have the app downloaded, look in your inbox, and you'll find an offer you can flash to your barista, when you show up for your afternoon pick-me-up.